It’s been talked about for years. When an earthquake in California tore down the freeway in the Bay Area, the conversation picked up steam. As young urban professionals decided they did not want to wallow in the suburbs built by their race-conscious parents, real estate in the urban core increased in value. Now, as New Orleans continues to rake in billions of dollars to rebuild parts of New Orleans not even affected by Hurricane Katrina, there is the possibility that Interstate 10 will meet the wrecking ball. If it happens, who will benefit from this massive public works project? Who will get the jobs? Whose businesses will be allowed to prosper? Who’s calling the shots, and who will pay the final cost? Chosen city officials, higher ups with a Boston consulting firm and a cabal of do-gooders all eager to put their stamp on sacred ground that has been the long cherished domain of the city’s African-American culture and commerce recently gathered at Joseph Craig Elementary School in the heart of Tremé. As they braced themselves to sit at the 17 circular tables decorated with giant colorful maps, Black markers, ink pens and yellow Post-it notes, most were unaware that their words and actions were seen by many in the room as harbingers of an effort to permanently alter the cultural and racial landscape of their city. They were gathering for one of the recent meetings of the I-10 Livable Claiborne Communities study put on by the city of New Orleans and Goody Clancy, the multi-million dollar urban consulting firm that has planned major – and some say disruptive – urban projects across America. In fact, Goody Clancy was at the forefront of the controversial Unified New Orleans Plan. The initial Livable Claiborne Communities study workshop held at Dillard University. A long-standing topic of controversy, the more than 50-year-old elevated expressway over Claiborne Avenue has taken its fair share of criticism. Talk of possibly removing the elevated 1-10 along Claiborne to achieve economic and social revitalization of the area strikes some as odd, if not disingenuous, considering the elevated expressway was erected despite the protest of mostly Black residents and business owners who foretold that plan would signal a downturn for their communities. With the building of the expressway, many Black business owners and homeowners saw the investments in their homes and thriving businesses demolished as buildings were torn down to make way for the thoroughfare. 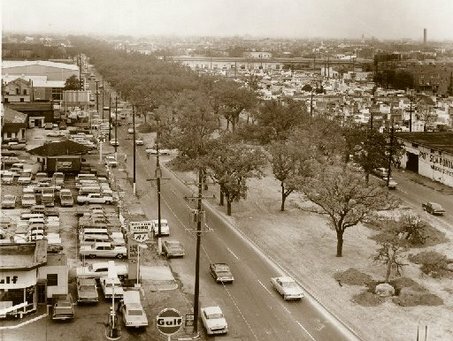 Many believe that the construction of the Claiborne overpass shares at least part of the blame for the decline of the Tremé neighborhood in the 1960s and 1970s. If there was one overriding theme to the gathering, it was a matter of examining who’s making the decision whether to tear down Interstate 10 along North Claiborne Avenue and who is benefitting from that decision. Without mincing words even as he positioned himself as a menacing force against racism, community leader Jerome Smith walked up to the microphone uninvited but totally prepared. Among the prominent White activists present were Pat Evans of Tremé 4 Tremé. But it was those from city government who drew attention. A casually dressed member of the mayor’s press office, who spent most of the meeting texting and asking media which media they were working for, walked around informing city staff what they could and could not say. One of those staffers was Bill Gilchrist, a savvy New Yorker who is with the mayor’s office of Place-Based Planning, which can be interpreted as either an oxymoron or a redundant phrase depending on the perspective. Tia Vice, a staffer with Councilwoman Kristin Gisleson Palmer’s office, arrived late to the meeting and did not speak with the press but did sit at one of the assigned tables. Other city workers were seen conversing with people in the audience but not engaging in much exchange with the media. When it comes to gentrification and the accelerated nature of it in New Orleans, apparently not all Whites are impacted equally. Beth Butler, a White social community leader who works in the finance industry, is well aware of what is happening in the Bywater and Holy Cross neighborhoods, two heavily gentrified neighborhoods that stand to benefit the most from their new demographics. But it will come with a price. Those “grunge” kids, the socially clairvoyant offspring of the Kurt Kobain generation sporting pierced noses, tattoo-splattered necks, arms and ankles that intersect with drug and alcohol use, primarily have a history of homesteading and loafing off their parents pockets and the generosity of strangers even as they enjoy the protection of well-fed dogs. They prey on vacant and abandoned properties while paying little if any rent. Moreover, they often, almost by osmosis and because of their race, receive police protection from the mostly Black and long-standing occupants of the neighborhood, according to those who have witnessed this component of the gentrification movement. Studies have historically shown that these very same rent increases disproportionately affect those who can least afford them. As a result, the inward migration of young Whites from places such as a working class Mount Horeb, Wisc., near Madison to the wealthier enclaves of New Hampshire, Boston and New York continues unabated. For their part, native and indigenous New Orleanians who have borne the brunt of the city’s physical and economic decline suddenly find themselves pushed out by the rising economic and political forces eager to turn a unique cultural fabric into a smorgasbord of tattoo shops, pizza parlors, art galleries and late-night bars catering to their individual and specific clienteles. Along Loyola Avenue in front of the renovated Hyatt Regency Hotel, a new streetcar line recently opened. It takes riders, ostensibly mostly tourists and convention goers, along the Loyola Avenue corridor, on to Canal Street and along the city’s riverfront. It is the same red streetcars that have been traversing Canal Street for nearly two decades, eventually connecting with the Canal Street and St. Charles Avenue streetcars. But the comparisons end there. Strategically placed on the route on Loyola are swanky new steel gray transit shelters, loaded with the accoutrements of comfortable seating, maps and a large television monitor to give updates on upcoming trains. When African-American transit riders were displaced to the darkened caverns of lower Canal Street and Marais Street, they found themselves waiting in the oppressive heat last summer for any number of transit buses that were re-routed for the streetcar construction. Calls to the Regional Transit Authority offices as well as Councilwoman Palmer, who chairs the council’s transportation committee, went mostly unheeded. That is until callers into WBOK AM 1230 voiced their frustration. Within days, new, green rugged reinforced benches were installed. Almost 99 percent of those RTA customers were Black, many of them getting off from work late at night and having to wait hours for their bus. Conversely, the new shelters on Loyola resemble the Parthenon in Greece, a monument to time and history that was not built in a single day either. They rest prominently on the neutral ground across from the U.S. Post Office, Entergy, the Hyatt and the Union Passenger Terminal. While everyday New Orleanians sit or stand at the green, littered-infested shelters on Broad Street, people boarding streetcars on Loyola are treated to the luxuries of first-class travel. These fancy shelters and the streetcar line were built from a kitty of federal dollars but they serve as microcosms of another ongoing problem, the capital improvement of a section of the city hardly damaged during Hurricane Katrina but one that has received a disproportionate share of the federal largesse. Another similar streetcar line is now being planned for North Rampart and St. Claude avenues. That line, which has now journeyed from the planning stages to an imminent reality, will take riders from the city’s downtown theaters and shops all the way into the Bywater, Marigny and Holy Cross neighborhoods. The new Rampart line did not go unnoticed by key people in attendance. “This is just another thrill ride for tourists,” stated Jacques Morial, who lives a block from the interstate and who is determined to make sure that the communities that bore the brunt of urban decay with the highway construction in the 1960s aren’t left holding more broken promises after its planned demolition. Morial pointed out how the Interstate that was built in the 1960s devastated the 6th and 7th wards from a cultural standpoint, as well as having a spillover effect on the 8th. When those decisions were made, African Americans had little if any political clout, and even less economic sway. Now, the conversation continues to happen behind closed doors, and it all adds to the negative perception and reality of the Livable Claiborne Communities conversation. “Nothing without us is for us,” said Morial. To be sure, throughout the three-and-a-half hour session, mistrust was the operative word. People went back and forth, from planning destinations to plausible deniability. If one person suggested one thing, another person questioned the motives. Often, it was done along racial lines, from the subtleties of culture to the obvious exclusion by race. Lisa Green-Derry, one of the participants at one of the livelier tables, said everything historically that has happened with this process and everything post-Katrina has resulted in African-Americans not trusting those Whites in charge to do the right thing. She told her colleagues at the table that such mistrust would ultimately hinder any progress, whether the interstate comes down or not. Green-Derry added that much of that distrust is “based on cultural equity” and the lack of it when it comes to post-Katrina New Orleans runs rampant. Even an astute White female participant noticed the disparities presented by those in attendance, and questioned quietly why the bulk of the session’s participants were from either the city, the consulting firm or other stakeholders, and not the people from the community who will be the most adversely affected. They, she noted, were fewer in number, albeit not silenced by being outnumbered. David Dixon, principal for Goody Clancy, had the misfortune of having to follow Jerome Smith’s opening salvo. He had the even more awesome responsibility of trying to convince his skeptics that the same Interstate Highway system that forever altered their culture and community would miraculously transform them by coming down. “We’d like to sit down with you,” Dixon said as he addressed the crowd, fired up by Smith’s opening but pragmatic enough many of the decisions have already been made. The slick and fancy green brochures and colorful charts and PowerPoint demonstrations dominating the discussion, Goody Clancy was well prepared for its audience comprised of urban planners, neighborhood organizers and government workers who are seeking to rebuild New Orleans in their image, with hardly little to none from input but neighborhood people. To be sure, overhead projector slides used by Goody Clancy presented a well-orchestrated, carefully concocted capsule of a concrete calamity suddenly going contemporary. At the intersection of North Claiborne and St. Bernard avenues there is as an ongoing reminder of how progress for some translates into misery for many. The high on-ramp from Claiborne near Elysian Fields is shown in one slide torn down. Underneath what was once a high ramp are now visitors—primarily tourists overrunning locals who yearn for their history and cultural preservation – inside a festival-like environment where music, food, crafts and urban gentrifiers occupy the landscape, while citizens who grew up around the corner try to figure out if they’re in an Orleans wonderland or Oshkosh, Wisconsin. Mona Lisa Saloy, a writer, faculty member at Dillard and head of the recently formed 7th Ward Neighborhood Association, told the audience that she and others haven’t all hopped aboard the tear-it-down bandwagon. Saloy and her allies cite the resulting “10,000 cars a day” flooding streets in the 7th Ward and Gentilly. Moreover, they questioned the motives of those calling for the tear down. That same individual pointed out to Saloy that the 70,000 residents of New Orleans East use the interstate daily, as do north shore and Mississippi residents who work in New Orleans. 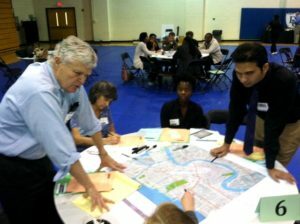 “Can you imagine what our neighborhoods would look like with 10,000 cars per day passing through. And, what about the 18 wheelers, and dump trucks? There’s more for ‘Black’ residents to loose then what’s being told,” Saloy’s colleague wrote. In the end, the fancy brochures with the colorful catch phrases of “sustainable solutions,” “equitable access,” “economic prosperity,” “enhance transportation choice and access,” “guarantee managed change to benefit the existing community” and “Scenario 1, 2 or 3 “What I…” carried the day. They became the coded language for those in the business of altering community landscapes and the feared language among those in no position to lose anything more. But such individuals, many from out of town, some of them riding bikes on newly paved streets with special bike lanes and others enjoying the economic impact of a gentrifying New Orleans, left this particular meeting well aware that people such as Jerome Smith have served notice that this civil rights movement won’t be determined by interlopers, planners and corrupt politicians. This will be a people’s movement, predicated on the notion that their vested and historical interests will never be mortgaged for a fancy schematic drawing where cultural shape shifters perform a chameleon like transformation of their community. For as Jerome Smith stated before he ended his lecture, the next time he comes back to visit these community builders, he’s bringing with him the ones who stand to lose the most. Lovell Beaulieu is a journalist and writer in New Orleans.